Lakeside Labs presentation room: October 14th, 2013, 2 p.m. 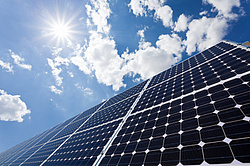 The installation of photovoltaic (PV) systems systems is growing specially in the rural zones where there is no sufficient connection to the low voltage network. As a fact, using PV system for rural housing electrification is more feasible that establishing a distribution network. In this presentation, science, technical and social implications of photovoltaic systems as a renewable energy sources are discussed. In addition to that, solar source assessment and modeling techniques are presented and optimal sizing procedures of systems energy sources as well as storage systems are reviewed. Finally, evaluation criteria of photovoltaic power systems are proposed. Tamer Khatib is a photovoltaic power systems professional. He holds a B.Sc. degree in electrical power systems from An-Najah National University, Palestine as well as a M.Sc.and a Ph.D degrees in photovoltaic power systems from National University of Malaysia,Malaysia. Currently he is a senior researcher at the Smart Grids Group of the Institute of Networked and Embedded Systems at Alpen-Adria-Universität Klagenfurt, Austria. So far, he has 2 patents, 2 published books and 59 published research articles meanwhile, his current h-index is 8. He is a member of IEEE, IEEE Power and Energy Society, The International Solar Energy society, Jordanian Engineers Association, Palestinian Solar and Sustainable Energy Association and International Association of Engineers. His research interests mainly fall in the scope of photovoltaic systems and solar energy fundamentals. This entry was posted in Veranstaltung and tagged photovoltaic, smart grid, smart microgrid, sustainability on October 14, 2013 by Wilfried Elmenreich.